In designing and constructing the Leopold Center, we embraced both new technologies and time-tested ideas to ensure the center would create positive connections between the built landscape and the natural landscape. Offices and meeting spaces are illuminated by sunlight and cooled by natural breezes from outside. Native plantings on the center’s grounds blend with surrounding savannas and forests. The building also uses renewable energy sources for heating, cooling, and power, cutting our dependence on fossil fuels and net emissions of carbon dioxide to the atmosphere. Moreover, the trees planted by Aldo Leopold and his family in the 1930s and 40s are a major building component in the Leopold Center. Incorporating as much local wood as possible made the building integral to ongoing conservation efforts at the Leopold Shack and Farm. The architects and engineers who designed the building thought carefully about its place in the larger landscape and how visitors would experience it – in short, how the Leopold Center would inhabit its world. Ecological and cultural values determined its placement. The Leopold Center is close to the Shack without overshadowing it. It necessarily sits above the Wisconsin River floodplain, and was built on an already disturbed site (where two houses once stood) rather than in a natural area. The visitor experience was also critical. The center employs a campus layout, with many access points between indoor and outdoor spaces to emphasize the visitor’s connection to nature even when inside. Likewise, native plantings around the building, parking lots, and paths reinforce the beauty of our natural heritage. The footprint of all impervious areas (building and parking lot) have been kept to a minimum, allowing as much rain as possible to soak naturally into the ground. Similarly, stormwater from the roof is carried via an aqueduct to our raingarden, where the rain is absorbed by the soil and native plants. Trees originally planted by the Leopold family were used to construct the building. In 1935, Leopold chose a worn out, abandoned farm for a family hunting camp. For more than a decade afterward, he and his family planted thousands of trees at the Leopold Shack and Farm to conserve the soil, provide habitat for wildlife, and return beauty and wildness to the exhausted land. In 2003, foresters determined that these “Leopold pines” were overcrowded and suffering from competition. Drought, disease, wind, or an insect outbreak could kill many of them. Thus, the foresters recommended a careful thinning of the smallest trees to restore the forest’s health. At the same time, an oak woodland on the property was cut to sustain light-loving oaks, an important but dwindling part of the southern Wisconsin landscape. Not only did these harvests help restore the forest, but they also provided an impressive quantity of high quality wood. Crafted into columns, beams, and rafters in the Leopold Center, the harvested oak, pine, and cherry trees now frame a beautiful space for discovering Leopold’s legacy. We also used small diameter trees “in the round” as structural supports – demonstrating a high-value use for a typically low-value wood product. The Leopold Center includes some reused materials, as well. Our stormwater aqueduct and the fireplace in our foyer are both faced with reclaimed limestone. It was salvaged from an airplane hanger built by the Civilian Conservation Corps in the 1930s at the Dane County Regional Airport. The Leopold Center uses 70 percent less energy than a typical building of its size. About half of these energy savings come from familiar conservation solutions, such as bringing in daylight to reduce lighting needs; installing higher than standard levels of insulation; and providing natural ventilation through windows and doors. An aqueduct conveys stormwater from the roof to a raingarden. The building also includes roof overhangs to block the sun in summer, and a “thermal flux zone” to reduce heat flow between the main office and outdoors. 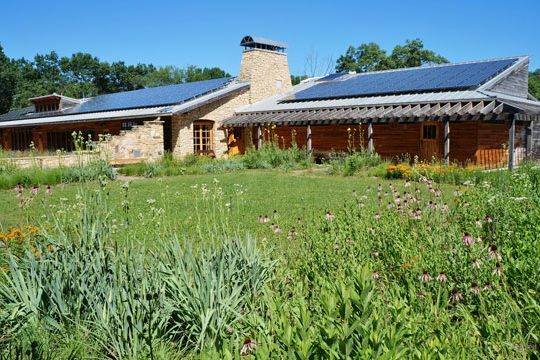 In addition to these conservation techniques, the building’s heavy use of renewable energy helped it achieve both a “carbon neutral” and “net zero energy” certification. Carbon neutral means the building produces no net emissions of carbon dioxide to the atmosphere, and net zero energy means all the center’s annual energy needs are met onsite. What are these renewable sources? Solar panels on the building’s roof capture the sun’s energy to generate electricity and heat water. Several fireplaces and wood stoves – fed by logging slash and carefully selected trees from the property – reduce our reliance on non-renewable energy such as coal and natural gas. The center also uses a geothermal energy system for heating, cooling, and ventilating. Compared to the extremes in air temperature that occur during a typical Wisconsin year, underground temperatures remain relatively stable. Geothermal systems take advantage of this, extracting heat from the ground in winter and using it to dissipate heat in summer. With radiant energy from the ground providing some of the heating and cooling, the center need less energy overall to stay warm in winter and cool in summer.